Hi Sparklies, today I wanted to share a fad that's been going on for sometime now. I first noticed it when I was working a flight and saw a teenage girl immensely colouring for 4 hours. When I landed, I starting looking up colouring books and realized Colouring Books for Adults is a thing now. It's been proven to be therapeutic and to relax our minds in the hectic world we live in. 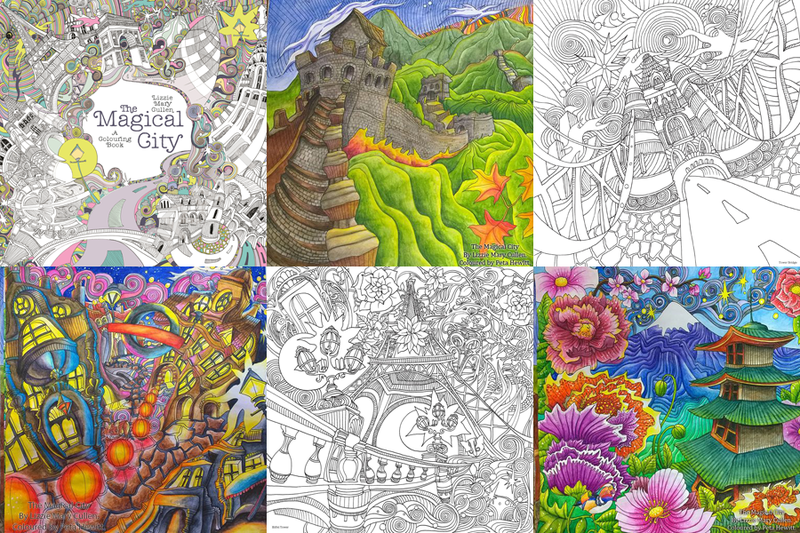 Personally, I find Secret Garden by Johanna Basford is the most popular colouring book to date. It was sold out in many locations at first and many people were looking for it all over. On Pinterest, I saw many inspirational coloured pictures and I really loveeee the illustrations in it so those became my #1 want :) I purchased mine in London, UK in a bookstore. Over 10 million copies has been sold and it has been translated in over 24 languages. Below, I shares some of the pages I've been working on and looking forward to colour. I find that with pencil crayons, I can do gradation techniques. Johanna Basford altogether released 3 colouring books along with other products such as artistry books and postcards etc. This book is her 2nd release. Part of me simply enjoy collecting so I really wanted this book, it might look nice as a coffee table item. Since I purchased this at a Hong Kong bookstore, it turned out to be translated into Chinese by a Taiwanese publishing company. That is why, it also came with a tiny, travel size copy. Super cool :) Another note about Basford's books is that all of hers are not computer draw but entirely hand illustrated. Whereas other books, many of them are not hand illustrated. This is a pocket size colouring book I picked up together with Secret Garden while I was shopping in a bookstore in London, UK. The price is very justified at about $10 and it's very convenient to bring along traveling. I mainly use markers to colour and it's probably my most coloured book due to its compact size. I've taken interest in the Magical City since buying colouring books but I'd like to be inspired before I purchase another book because it's just me hoarding if I don't end up using it. On the almighty inspirational Pinterest (my pins are not all public but wow, I pin everything! ), I found this book when coloured can turn out super abstract and I love the delusional-out-of-the-world-on-crack-whacky feel I get from it. Thanks to Peta Hewitt (Youtuber who coloured the above).... now I want this book! I'm not trained as an artist nor do I have any drawing talents. In our Ontario high school curriculum, there's a required art class in Grade 10, I achieved an epic-close-to-fail grade. However, that being said, I do enjoy doing crafts and stuff. Whenever I colour at work, I get asked at work when I start colouring where I get my colouring tools so I'll share what I use. I hope to learn more and experiment with watercolour pencil crayons in the future. Do you colour? What colouring books do you own now? What are your favourite colouring tools?